To celebrate IYC 2011, Chem 13 News together with the University of Waterloo Chemistry Department and the Faculty of Science, Waterloo, Ontario, Canada, encouraged chemistry educators and enthusiasts worldwide to adopt an element and artistically interpret that element. The project created a Periodic Table as a mosaic of science and art. Some of the participants who were able to attend the mural installation ceremony held for project participants, organizers, and sponsors on 10 April 2012. The final product is an amazing table of artwork for each elemental tile designed by chemistry students from all Canadian provinces and territories, 20 U.S. states, and 14 countries. It can be viewed online and is available as a printed poster. 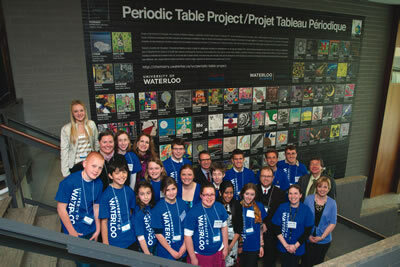 The Periodic Table Project is also displayed as a mural in the foyer of the Earth Science Museum at the University of Waterloo. The official installation of the 25-by-18-foot wall mural (about 8 by 6 meters) was on 10 April 2012. Over 140 people came out for the ceremony, including several of the student-artists who designed elemental tiles. Project sponsors, 3M Canada and the Chemical Institute of Canada, also were on hand to witness the event. 3M Canada manufactured the large wall mural with 3M™ Scotchcal™ Graphic Film for Textured Surfaces, a thin-layer polymer with high resolution and vibrant colors. 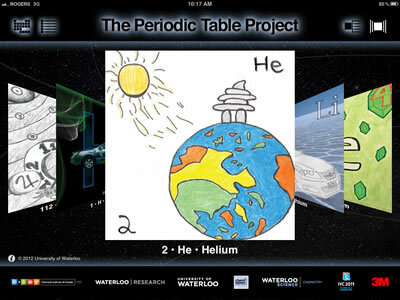 3M Canada also designed the electronic applications for the Periodic Table Project including apps for the iPad and Playbook. The celebration was an opportunity for participants, organizers, and sponsors to gather together, some for the first time, to celebrate the collaborative effort of this International Year of Chemistry project.